(Nanowerk News) The word "HAZMAT" describes substances that pose a risk to the environment, or even to life itself. 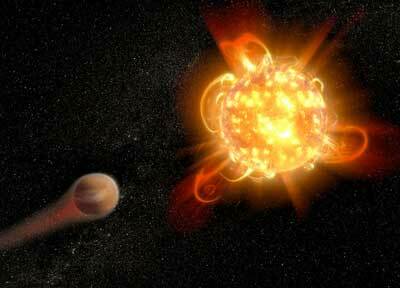 Imagine the term being applied to entire planets, where violent flares from the host star may make worlds uninhabitable by affecting their atmospheres. NASA's Hubble Space Telescope is observing such stars through a large program called HAZMAT -- Habitable Zones and M dwarf Activity across Time. "M dwarf" is the astronomical term for a red dwarf star -- the smallest, most abundant and longest-lived type of star in our galaxy. The HAZMAT program is an ultraviolet survey of red dwarfs at three different ages: young, intermediate, and old. The team has found that the flares from the youngest red dwarfs they surveyed -- just about 40 million years old -- are 100 to 1,000 times more energetic than when the stars are older. This younger age is when terrestrial planets are forming around their stars. Approximately three-quarters of the stars in our galaxy are red dwarfs. Most of the galaxy's "habitable-zone" planets -- planets orbiting their stars at a distance where temperatures are moderate enough for liquid water to exist on their surface -- likely orbit red dwarfs. In fact, the nearest star to our Sun, a red dwarf named Proxima Centauri, has an Earth-size planet in its habitable zone.